There are around a Million Muslims living in Myanmar (Burma). These Muslims have always faced discrimination in Buddhist populated country. During long Dictatorship these Muslims continued to face human rights violations. Few months ago Democracy came in Myanmar by getting rid of long dictatorship. There where hopes for peace but instead of peace Muslims are facing largest Massacre from start of June last month. 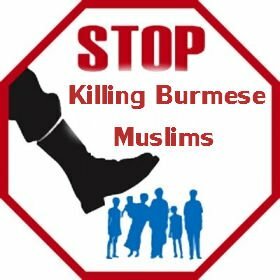 More than 15000 Muslims are killed by Buddhist terrorist groups. Thousands of houses are burnt and many people are displaced. The sad thing is that International Community and Media is completely silent on these Killings. In Mainstream media we are seeing lot of news about Syria but what about Myanmar? Are people getting killed in Myanmar are not Humans? This attitude of Western Leadership and Media shows their hypocrisy that they only care for their interests not humanity.